A wood crib performance model (WCPM) was developed to assist in the design of wood cribs and their deployment in mines to ensure the safety of underground coal mine workers. 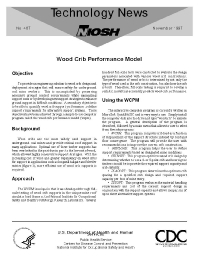 The WPCM was developed through full scale testing of wood crib supports in a mine roof simulator load frame at NIOSH in the Pittsburgh Research laboratory. The design was evaluated under several hundred full scale tests. This interactive computer program was written in Microsoft QuickBASIC and had the advantage that it was easy to use. There were five subprograms, each with its own purpose and function: WPCM, MINLOAD, CRIBOPT, PLACOPT, SYSOPT. WCPM computed crib load as a function of displacement of the support structure induced by roof and floor convergence, assisting the user with recommendations to improve construction of the current crib. MINLOAD helped define support requirements based on the conditions of the designated mine. CRIBOPT optimized wood crib design by determining whether to use a 4 or a 9 point crib and what size timbers were needed to provide the needed support. PLACOPT determined the optimum crib spacing for a specific crib design and required support capacity per foot of mine entry. Finally, SYSOPT evaluated the material handing requirements and cost of the current support design along with the support capacity and allowed comparison of up to three alternative support systems.